Is Trump Really the President-Elect? The Recount in On! The US government is possibly the most corrupt among the major industrialized nations, and probably more corrupt than many third world nations. This is because there is little difference between the Democratic and Republican Parties, and the rich people who manipulate them like puppets. So, quite naturally, one can be suspicious of US election results at just about any level of government. And yet the leaders of both parties want us to believe such corruption does not dirty our elections. They’re wrong. So now Donald Trump must go through the agony of recounts in three states: Wisconsin, Michigan and Pennsylvania. 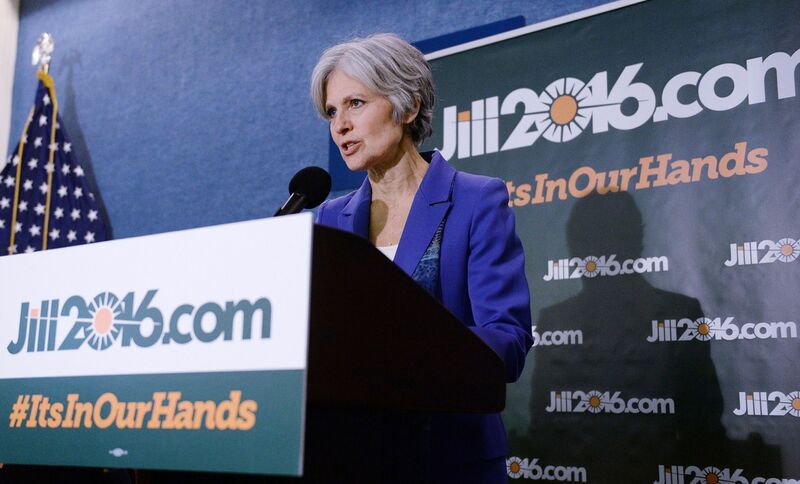 This recount effort is spearheaded by Green Party candidate Jill Stein, but the Clinton camp has decided to help ensure the accuracy of the recounts. Exit polls showed Clinton winning all three states. Clinton, by the way, may not have defeated Bernie Sanders in the Democratic primary without the use of electoral fraud; her wins in Arizona and New York come readily to mind. Donald Trump, who told us of such election fraud, is not happy about these recounts. No Republican has become US president without a high degree of electoral fraud during the last 28 years. 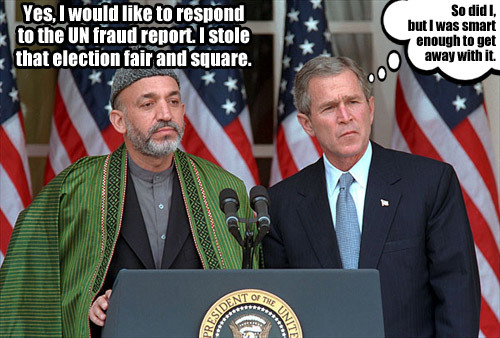 George W. Bush became president in 2000 with the use of voter suppression, and a number of other dubious tricks. His win over challenger John Kerry in 2004 was filled with corruption. The reports of corruption in 2004 were especially dramatic in Ohio, the critical battleground state that clinched Bush’s victory in the electoral college. Officials there purged 190.000 Democratic voters from the rolls between the primary and the general election and didn’t notify any of the voters. Ohio officials also failed to process registration cards generated by Democratic voter drives, shortchanged Democratic precincts when they allocated voting machines and illegally derailed a recount that could have given Kerry the presidency. A precinct in an evangelical church in Miami County recorded an impossibly high turnout of ninety-eight percent, while a polling place in inner-city Cleveland recorded an equally impossible turnout of only seven percent. In Warren County, GOP election officials even invented a nonexistent terrorist threat to bar the media from monitoring the official vote count. There were serious problems throughout the nation on November 2, 2004. What is most glaring about the irregularities in 2004 was their decidedly partisan bent: Almost without exception they hurt John Kerry and benefited George Bush. So bring on the recount. Besides, what does Donald Trump have to fear? 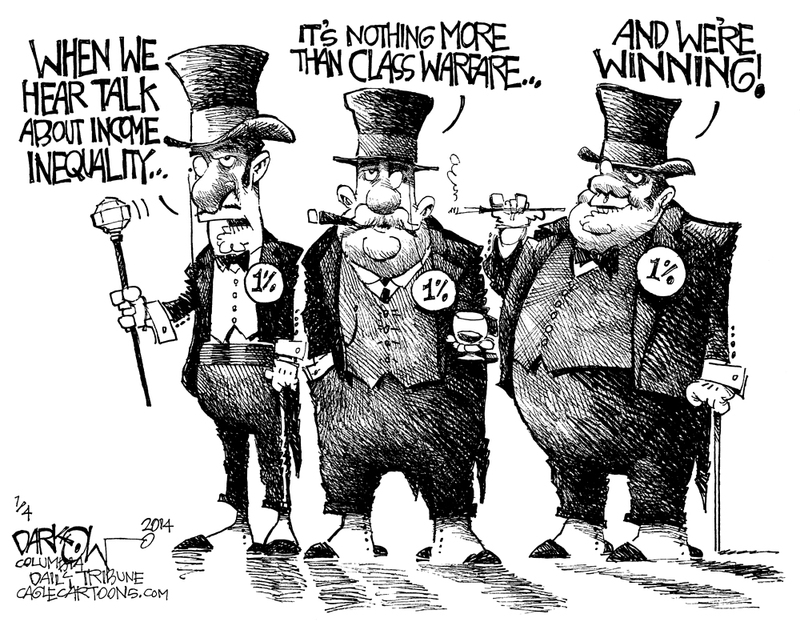 The US government has been redistributing income from the 99 to the 1 percent for the last thirty-five years. The result of this government created income and wealth inequality has been an economy far weaker in virtually all measurements than any of the last century. That’s because the underlying economic factors have been weakened. “Although income and earnings have increased over the past 30 years, they have changed little in the past decade. 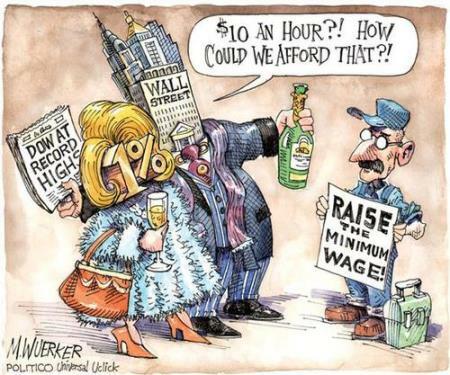 The typical worker had wage growth of 22 percent between 1979 and 1999 but just 2 percent from 1999 to 2009. (This is not in inflation adjusted wages, in which case, wages would’ve been stagnant or declining over the last thirty-five years). • The Great Recession eroded 20 years of consumption growth, pushing spending back to 1990 levels. Over the 22 years before the start of the downturn, household expenditures grew by 16 percent. But households tightened their purse strings after the start of the recession in 2007, and spending has yet to recover. As a result, the net increase in average annual household spending is just 2 percent since 1990. That’s despite twenty-six years of inflation growth. • The majority of American households (55 percent) are savings-limited, meaning they can replace less than one month of their income through liquid savings. Low-income families are particularly unprepared for emergencies: The typical household at the bottom of the income ladder has the equivalent of less than two weeks’ worth of income in checking and savings accounts and cash at home. • Even when pooling all of its resources—including from accounts that are potentially costly to access, such as retirement accounts and investments—the typical middle-income household can replace only about four months of lost income. • Most families face financial strain across all balance sheet elements: income, expenditures, and wealth. In addition to being savings-limited, households face other financial challenges; just under half of families are “income-constrained,” reporting household spending greater than or equal to their income; and 8 percent are “debt-challenged,” with payments equal to 41 percent or more of their gross monthly income. Fully 70 percent of households face at least one of these problems, with many confronting two or even all three. What’s Wrong With the Political Left and Why Did Trump Win? The lady in the video below argues that everybody who voted for Trump was a racist, and no I did not vote for Trump or Clinton. They had too much baggage for me to vote for them. 1 If you voted for Trump because Clinton had a history of exporting US jobs overseas, then you are a racist. 2 If you voted for Trump because he was against exporting jobs overseas, then you are racist. 3 If you voted for Trump because exporting jobs overseas increased income inequality in the USA, then you are a racist. 4 If you voted for Trump because he was against gun control, then you are a racist. 5 If you were suspicious of Clinton’s tight financial and political ties to Wall Street, and you felt you had no choice but to vote for Trump, then you are a racist. 6 If racism wasn’t your number one issue, then you are a racist. I could go on and on, but I found somebody who expresses my point of view on this matter really well. Jonathan Pie is a political satirist based in the United Kingdom. He has a really good rant about what occurred in the election on November 8. During this rant he mentions Theresa May, the arch conservative prime minister of the United Kingdom, and says that on many issues May is to the left of Hillary Clinton. My impression is that the woman in the video above is part of the problem, and not the solution. She seems very narrow minded and bitter. That’s exactly what the corporate news media does to us. It divides us. This woman has fallen for the bait, hook, line and sinker. The New York Times recently reported that Toys R Us had exported 67 jobs from its headquarters to India via the H1B visa. “A temporary visa program known as H-1B allows American employers to hire foreign professionals with college degrees and “highly specialized knowledge,” mainly in science and technology, to meet their needs for particular skills. Employers, according to the federal guidelines, must sign a declaration that the foreign workers “will not adversely affect the working conditions” of Americans or lower their wages. Then the H1-B visa worker must have “exceptional skills,” but that is rare, especially in the case of Toys R Us. Toys R Us employees trained their replacements so their jobs could be more easily exported to India. Of course they are! 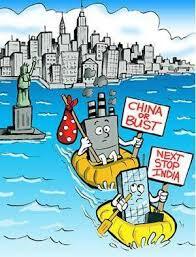 That is the purpose of the H1-B visa, and always has been. 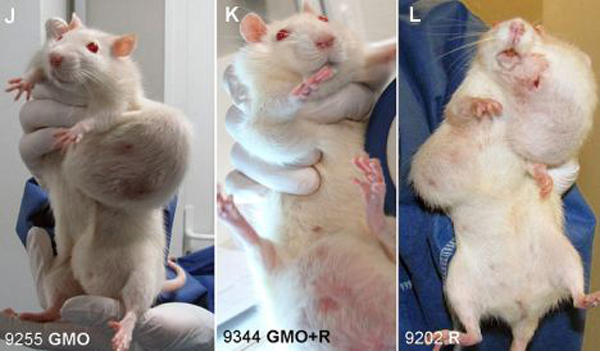 Tumors began growing in these rat after three months of being fed GMO foods. One thing I’ve noticed over the years; both the conservative and liberal corporate press like to deceive us. The Wall Street Journal and the New York Times are both good at this. Neither will mention certain things that might offend members of the leisure class or the management of corporate advertisers. GMO’s are a perfect example. The blue line represents GMO crop yields and the yellow line represents traditionally planted crop yields. There are plenty of peer reviewed studies in academic journals that demonstrate the health hazards of genetically modified foods (GMOs), and neither newspaper dares to mention any of them. But these media outlets will mention studies done by the GMO corporations purporting to show GMOs are safe for human consumption. That’s to keep us ignorant, and to keep those advertising dollars coming in. The Times recently ran a story about how the yields of GMO crops are about the same as traditionally planted crops. There’s virtually no “discernible difference in yields,” according to the story, unless you go to the Times online. Then you discover that GMO crop yields are largely inferior (and by wide margins in most cases) to traditionally planted crops, but the editors didn’t want us to know what was right before our eyes. Maize crop yields. 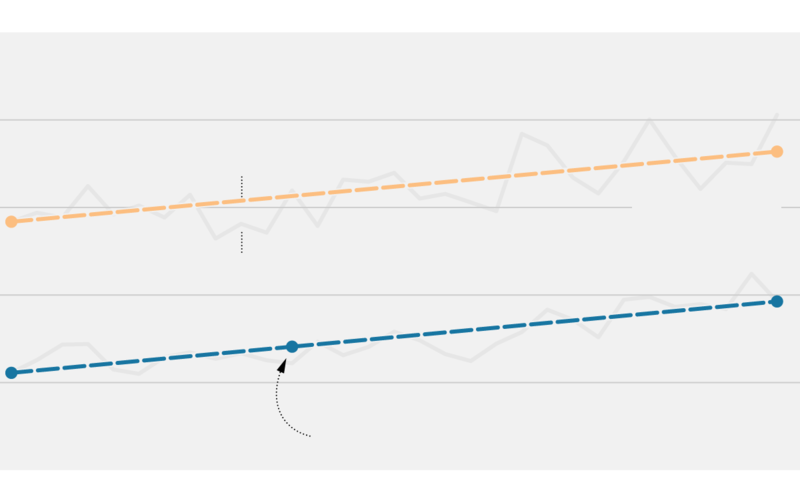 Blue line = GMO yields; yellow line = non-GMO crop yields. 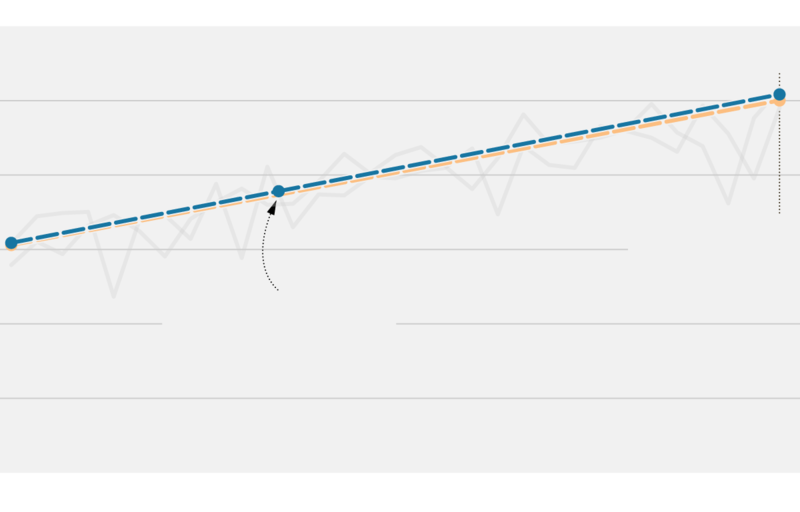 You can see in the graph above that traditionally planted rapeseed yield is far superior to GMO yields. Vegetable oils are produced via rapeseed. The yield for corn is the same between GMO and traditionally planted crops. You can also see from the graph furthest below that the yield for non-GMO planted sugar beets is far greater than GMO sugar beet yields. Sugar beet production. Traditionally planted sugar beets have superior crop yields compared to GMO sugar beets. In other words, the corporate media and the GMO industry have been lying to us for decades, and they still are. 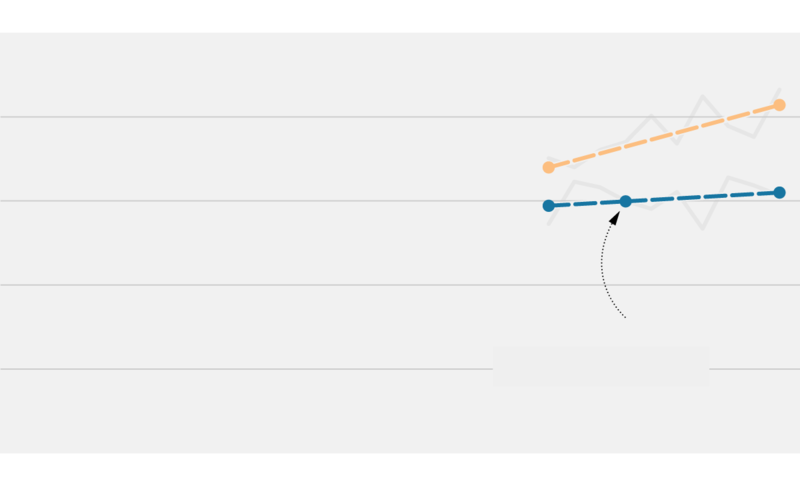 The graphs in this story are taken straight from the New York Times, but you had to go online to get them. Given this, it is obvious there is no rational reason for GMOs to be in the human food chain since they are largely inefficient or equal in yields compared to traditionally planted crops. Sioux Chief brought back jobs to Kansas City, Missouri from Mexico. The plant manufactures plumbing products. The facility is now operating at full capacity. The Nogales plant was acquired along with two other plants when the rough plumbing manufacturer purchased Watts non-core product line in September 2015, consisting of assets related to its brass ttings, brass & tubular and vinyl tubing product lines. This move further demonstrates Sioux Chief’s ongoing commitment to manufacturing the majority of its SKUs in the USA and gaining control over the entire manufacturing process to guarantee the highest quality. Additionally, the relocation has provided Sioux Chief with the opportunity to add an additional 30 dedicated, hardworking Americans to the company family.